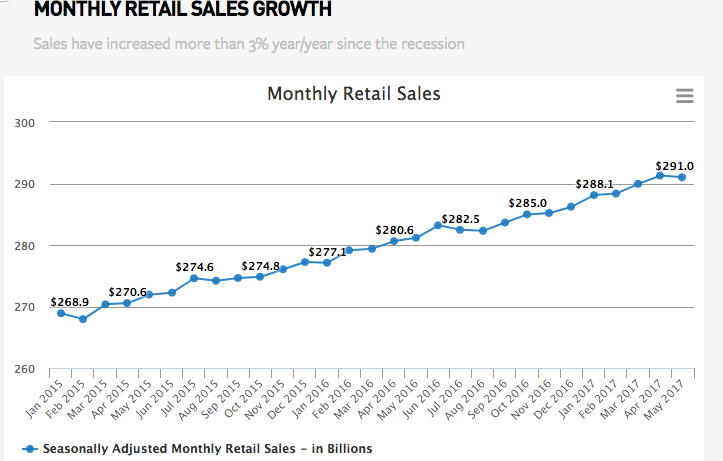 NRF presents even more data this week that the “death of retail” is highly exaggerated. For an industry that’s “dying” retail sales are pretty solidly up and to the right growing at 4% annually since 2010 and 76.9% of retailers beat their Q2 EPS. Not too shabby. Retailers still need to adopt and are struggling with the role of eCommerce and Omnichannel and how to invest to differentiate their in-store experience from Amazon. Cisco has a handy assessment tool on how to thrive in an Amazon world that leads with creating dynamic customer experiences. We at PERCH agree! Make your shopping experience sing and win customer loyalty. To prioritize, don’t iterate with a linear process or you might shortchange transformation. Instead focus on the big 5 attributes for a litmus test - Engaging, Unique, Personalized, Surprising and Repeatable – that’s what we strive for with our interactive digital + physical displays for clients. RIS put out a nice Customer Tech Engagement Trends white paper with great data on it including where retailers are focusing their tech investment dollars and where they see the primary challenges in innovation.. Worth giving your email address for the read. 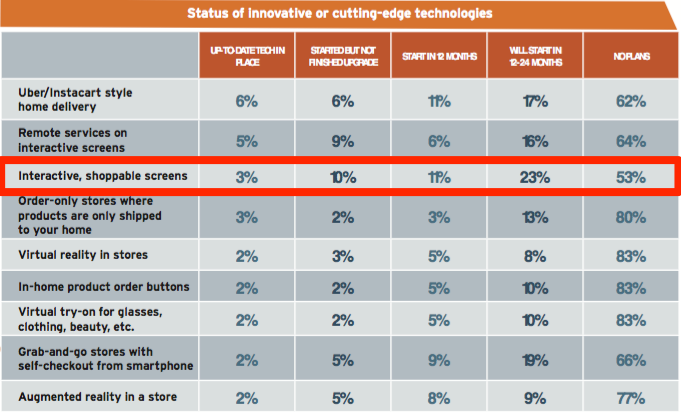 Here's some of the data we gleaned from it, including interactive screens being the leading investment to increase customer engagement. It’s dangerous to try to compete with the convenience of eCommerce and if you take that mantra too far you are in danger of the warehousing of your retail stores in a way that eliminates the enjoyable experience of discovery and serendipity. Focus first on where you have advantages by understanding how shoppers enjoy shopping through their journey. Focusing on convenience advantage like the pain of packaging up returns to Amazon makes much more sense and Walmart is now guaranteeing 30 second returns without the mess of cardboard boxes, shipping labels and all that sticky packing tape. Smart. Forrester argues that the luxury market should be adopting tech as fast or faster than their tech savvy customers and that digital on top of physical shopping is going to be key. We obviously very much agree. Speaking of, Amazon continues to provide digital content and tech in it’s physical bookstores. Is this a good model for the future? Retail experts weigh in on whether DSW’s new in-store shoe rental services will give customers more reasons to step into their stores and drive incremental revenue or whether it will fail. Voice-first commerce is heating up. Walmart and Target are getting in bed with Google to try to compete with Amazon and Alexa. Will the anti-Amazon alliance bear fruit or disintermediate retailers into search? Brands are investing in retail vending machines in the US. Is the time of automated retailing here and who will win? There you go. Retail marketing news from around the web. Did we miss something? Want to submit a guest blog? Email us at info@perchinteractive.com.